A leading firm of insurance surveyors and contractors is running seven Mitsubishi Outlander PHEVs on its fleet after assessing the benefits the plug-in hybrid would have for its business. 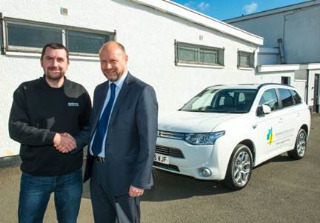 Grangemouth-based Edinmore Contracts opted for the Outlander PHEV based on its combination of fuel economy, low emissions and tax savings as well as its all-round practicality and performance. It now plans to add more Outlander PHEVs to its 82-strong fleet as vehicles come up for replacement, moving towards a single-manufacturer fleet solution. The vehicles, which have been supplied by Belmont Mitsubishi in Sighthill, Edinburgh, are used by its team of surveyors and contract managers, who cover the whole of Scotland and clock up between 40 and 120 miles a day on average. Gordon McRae, fleet manager, Edinmore Contracts, said: “We were looking for something more economical and with lower emissions and lower Benefit in Kind tax. The PHEV was perfect. McRae continued: “The vehicles are still new and so we’re still analysing the data but the early signs are very encouraging. We’re definitely making savings. “I think we’ll now look to standardise our fleet by adding more Outlander PHEVs as our other cars come up for replacement.